Πατήστε τη φωτογραφία και δείτε όλες τις φωτογραφίες του Casa Paradise. 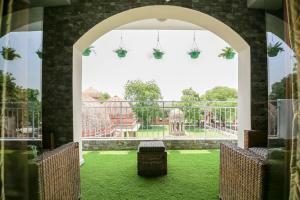 3.2 km from Qutub Minar, Casa Paradise is located in the Hauz Khas district of New Delhi. It is situated 7 km from Rashtrapati Bhavan and offers free WiFi plus luggage storage space. The apartment includes 2 bedrooms, a bathroom with free toiletries, a living room, and a kitchen. A flat-screen TV with cable channels is available. à la carte and Asian breakfast options are available every morning at Casa Paradise. Humayun's Tomb is 7 km from Casa Paradise, while India Gate is 8 km from the property. The nearest airport is Delhi International Airport, 9 km from the property.